Unfortunately we’re ending garden week on a low note. I was very optimistic about our tomatoes this year. We had beautiful big green tomatoes. I was just waiting for them to turn red and then I would be devouring my favourite tomato sandwiches. 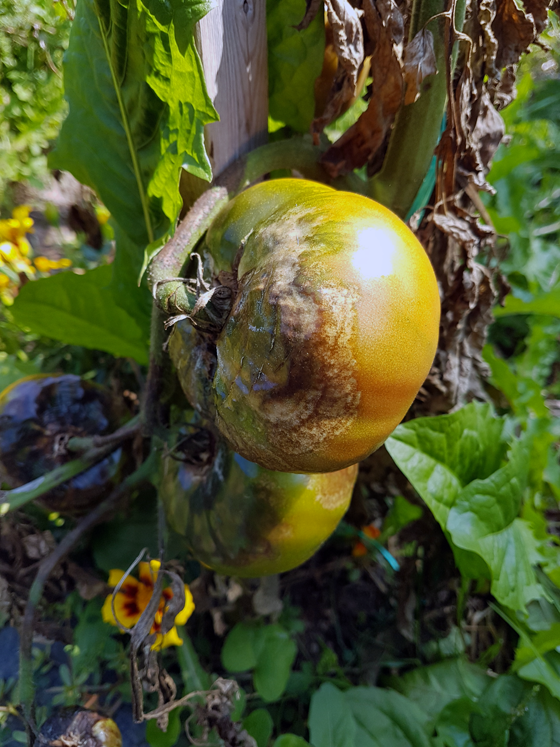 From what I’ve heard from other gardeners in our area, tomato blight is pretty prolific this year. Many people have lost their crops. I thought we were going to squeak through, but the blight has now hit us as well. 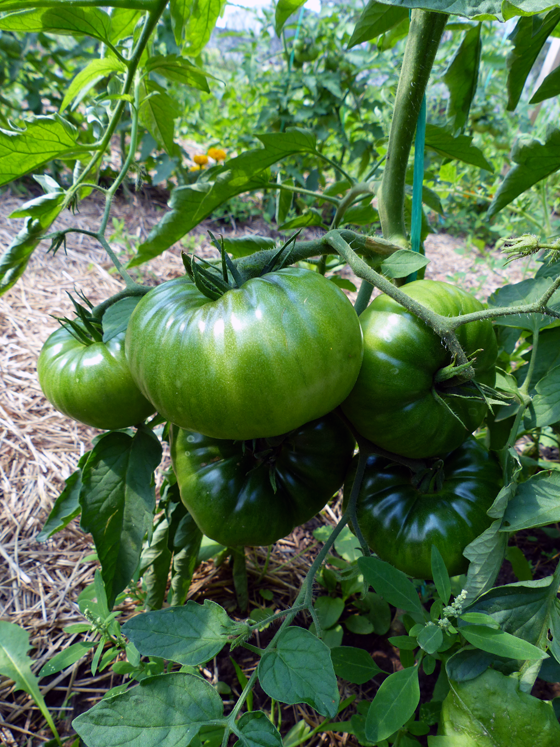 It started with our Black Krim tomatoes–this year’s new variety. The plants died first. The stalks developed brown patches, then the leaves withered. And now the fruits themselves have started to shrivel, darken and fall off the plant–even as a few of them have tried to turn red. 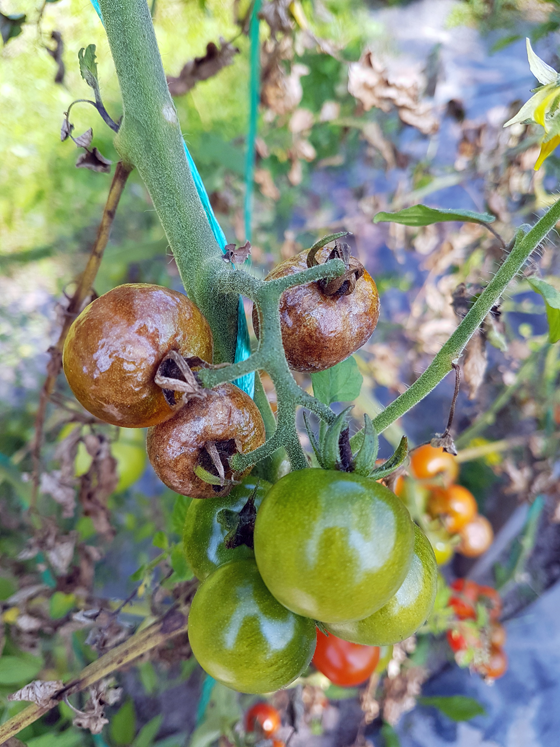 I thought the blight might be limited to the Krims, but it’s now spreading to the Mountain Merit beefstakes and even our usually resilient cherry tomatoes. To try and curb the blight for next year, I will be ripping out our plants and throwing them on the burn pile rather than composting as we usually do. And rotation is a must to ensure that next year’s tomatoes are away from the blight. 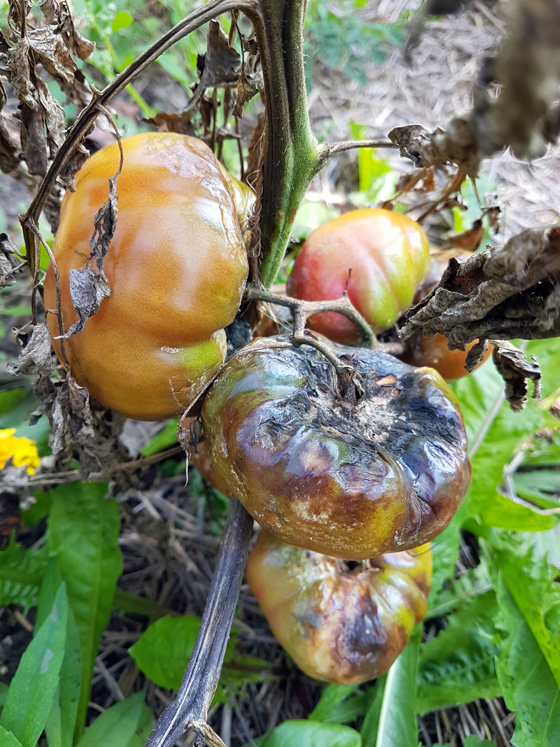 Have you had any blight issues this year? How have your tomatoes grown? What’s your favourite way to enjoy tomatoes? What a shame! One thing I learned at a local farm this summer is that tomato blight can live in the soil for three years without food, I.e. tomatoes. Make sure you have at least a four year rotation before the tomatoes return to that spot. Thanks for the tip. I think I should be able to make it work with the quadrants in our garden. The plan is to literally rotate things around the ring. Well, that really stinks! Again, we had the opposite issue with our tomatoes. I have canned and canned and our vines are still full. My Cherokee Purple are the only ones that didn’t do as well as I had hoped. 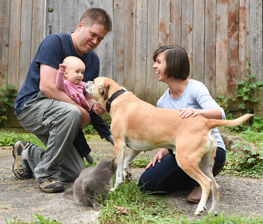 Do you have any farmer’s markets near you? You can’t go without any garden fresh tomatoes! That sounds so wonderful! I’m happy that you’ve had such success. We do have markets and farmstands around, so I won’t be completely deprived. Sad to see and so frustrating after all of your hard work, I’ve been a victim in past years. I also learned not to rotate them with peppers as they are in the same family. Frustrating indeed. Our peppers and tomatoes usually grow in the same area, so my plan is to rotate them both next year. Any tips on keeping them together or not? They are ok to keep together, just make sure your tomatoes don’t shade your peppers. Fresh sliced tomatoes, still warm from the garden, topped with a big helping of cole slaw! Probably my favorite side – especially with fried catfish (marinate in hot sauce then cover in cornmeal before frying in a bit of oil). That sounds yummy. I had my tomato sandwich for dinner tonight, which was also super yummy. What a shame. it is soul destroying when something like blight hits. We put so much effort into our gardens. To have it not work out by something we can’t control is really frustrating and discouraging and sad.